Marino Franchitti has been confirmed today on the driving squad for the new Acura-powered Courage LC75 run by Andretti Green Racing in the ALMS in 2007. Bryan Herta was already down to drive the Andretti Green Courage – which just leaves the number of races that each driver will race in to be confirmed. The team hasn’t so far indicated that Marino Franchitti will drive for the full season. His brother Dario is a potential / occasional driver for the ALMS branch of the team, which will almost certainly need three drivers for at least Sebring and Petit Le Mans. Al Larsen at Andretti Green racing clarifies the driver issue a little by explaining that neither Marino's schedule, nor the identity of any other drivers, have been finalized yet. "We believe to be within a few days of that announcement, but we can't confirm the final piece of that puzzle just yet." “Marino’s background is virtually all in sports cars and he should be a big plus in the development of our ALMS program,” says Michael Andretti, the team’s Chairman. “He has shown the ability to run up front and just needs an opportunity like this to show what he is capable of doing. 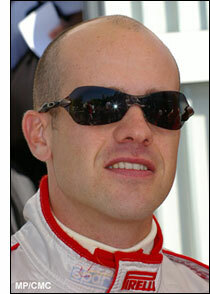 The combination of Marino and Bryan Herta will help give us a very strong lineup as we enter our first season in ALMS." The Scot has had an interesting and varied 2006, which looked as though it would largely focus around a drive alongside Milka Duno, in the Citgo Racing / SAMAX Daytona Prototype. That drive fizzled out though, but Franchitti found some rewarding drives with Scuderia Ecosse and Risi, finishing second at PLM and winning the FIA GT event at Adria. Now he’s back in an open prototype, after an overlong delay following what looked like a promising season with Rand Racing in its B2K/40 Lola in Grand-Am in 2002. The team owner pulled the plug on that one. “Bryan has a tremendous amount of experience from both open-wheel racing as well as sports cars and I plan to learn all I can from him,” says the modest Franchitti. “Overall, we have a very solid team and I look forward to developing and putting the package on-track and seeing where we stand."